"I first came across Yamanishi trowels on a visit to Alberta Canada, where I was teaching a lime render workshop. After a slight adjustment in the way I usually hold a trowel and a brief introduction to the types of steel and uses of these trowels, I found them to be great in many different applications. The different holding position of these trowels enables great control with the top portion of the trowel and in some ways a more fluid application. Whether its a heavy sand/lime base or a fine putty coat, these trowels performed brilliantly." 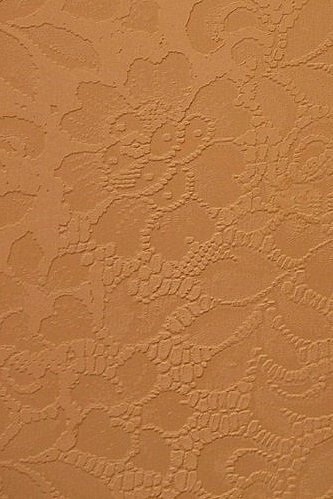 "I have been working in the conventional and decorative plaster trade for the past 14 years. I started using Japanese trowels about 4 years ago when I had the opportunity to work along side some plasterers from Japan. After going through lots of machine made trowels, I purchased a set of handmade Yamanishi trowels. The craftsmanship was so amazing I almost didn’t want to get them dirty. Since then I have put them to great purpose and they are extremely well made. I can’t imagine working without them. With the Hanyaki steel, heavy materials such as Hydraulic limes and OPC are MUCH easier to work with. The Honyaki steel doesn’t grab or scratch on compressed and polished finishes like other trowels. I highly recommend them!" "Just to let you know, I have just finished a lime plaster ceiling and the trowels are amazing. You have put together a perfect set of six. They are beautifully made and well balanced. There seems to be a lack of traditional plastering sites offering such wonderfull help and products. I for one wont be returning to machine made trowels. I must say these trowels have made my work far more enjoyable and improved the finishing. I would say they take it to another level because they are so well made they instil the same sense of care into the plasterer or artisan using them." "I have just finished a very large flat wall and I found the finishing trowel to be the most amazing trowel I have ever had the pleasure of using. The finish it gave was second to none and the quality of the trowel makers work is unsurpassed." "I have been using some 'contemporary' Japanese trowels for a couple of years - these were ideal for polishing various stuccos. When I started applying Shikkui plaster - I found most of my trowels were strangely unwieldy and cumbersome when faced with such a beautiful and capricious plaster. Having worked along side some great Japanese plasterers in Fukouka - who used Yamanishi trowels - I sort to find where I could lay my hands on them. Finding Kyle's blog and magic set of 6 felt like the discovery of a hidden treasure trove. The trowels perform beautifully - to know that one has a stunningly hand crafted trowel - the different grip becomes second nature very quickly - makes the practise of work even more rewarding. These trowels have an indescribable quality - a little like the plaster itself." 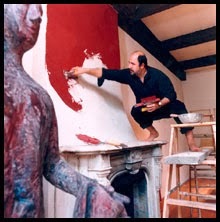 "I'll argue, having used many American-style trowels, Italian venetian trowels, and my fair share of the flexible mass-manufactured Japanese-style trowels, there is nothing, I mean nothing, that compares to these hand-forged trowels in terms of weigh, balance, quality, ease of use, efficiency of application, etc." "Great trowels, beautifully made. I bought some for a maiden job with Japanese plaster. Although they take some getting used to if you're accustomed to a traditional western trowel, they're very well balanced in the hand so you soon get a feel for them. I've gone on to use them with other types of plaster and have found them an absolute pleasure to work with. I look forward to trying different trowels in the range. And on top of that, great communication and very speedy service." "I had a hunch that the western style trowel I got in the last shipment would be good to use in the final stages of flattening, or 'trowelling out' as it's called here, and it has proven to be so. Please pass on my compliments and gratitude to Yamanishi-san for his great work." 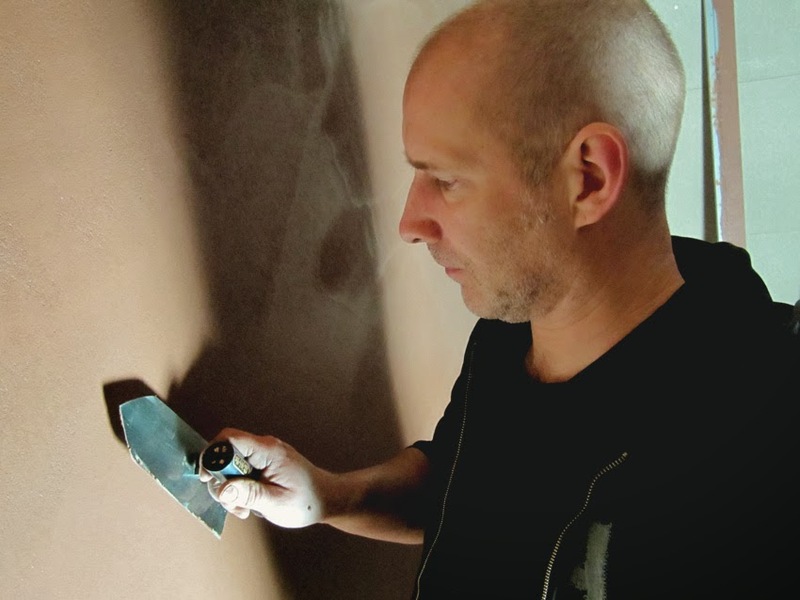 "I am loving working with the Japanese trowels and plaster. I guess i should start thinking of a trip in Japan!" Orazio De Gennaro Studio, Inc.
"Nachdem ich eine lange Zeit nach japanischen Kellen gesucht habe, stieß ich glücklicherweise auf Kyles hervorragende Website! Ich arbeite schon eine ganze Weile mit japanischen Kellen, allerdings ist die Auswahl auf dem deutschen Markt recht begrenzt. Zum Test bestellte ich ein paar Yamanishi - Kellen und war begeistert. Über die unkomplizierte Bestellung, die ausgezeichnete Qualität der Verarbeitung und die des Materials war ich sehr positiv überrascht. Gerade bei den traditionellen Kellen überzeugt die Robustheit und verspricht ein Leben lang zu halten. Die Werkzeuge sind hervorragend ausbalanciert und ermöglichen somit ein ermüdungsfreies, Arbeiten. Sie liegen auch nach langen Arbeitstagen noch angenehm in der Hand. Im Gegensatz zu den europäischen Verputzerwerkzeugen sind die japanischen doch erstaunlich grazlil so dass man sich anfänglich sehr an ihren Gebrauch gewöhnen muss. Wenn man diesen Schritt erreicht hat, kommt man nicht umhin zu denken, europäische Kellen seien für Grobmotoriker geschaffen... Mit ihrer Leichtigkeit sind die japanischen Werkzeuge den europäischen Kontrahenten in ihrer Handhabung weit überlegen. Es macht einfach Spaß mit ihnen zu arbeiten! Für Freunde der feinen Putze und der edlen Putzoberfläche sind diese Kellen unumgänglich! Der Preis lohnt sich und macht sich sehr schnell bezahlt! Ich spare schon auf die nächsten paar „Yamanishis“.... Ein großes Lob noch an Kyle für seine Arbeit! Kyle vient de m'expédier ce qu'il faut pour attaquer le coeur du sujet: le shikkui.... je reviendrai vous en parler. Merci encore et à bientôt." "I received some Japanese plastering trowels from you in October 2014 through my daughter-in-law, and I was very impressed with the balance and quality of them. You have made an old Plasterer very happy. I do not go home after a hard days work with so many aches and pains as I used to. And that is big plus. Previously I used Marshaltown and Curry trowels from the U.S.A., but I wont be any more, as I am a convert to these wonderful Japanese trowels. 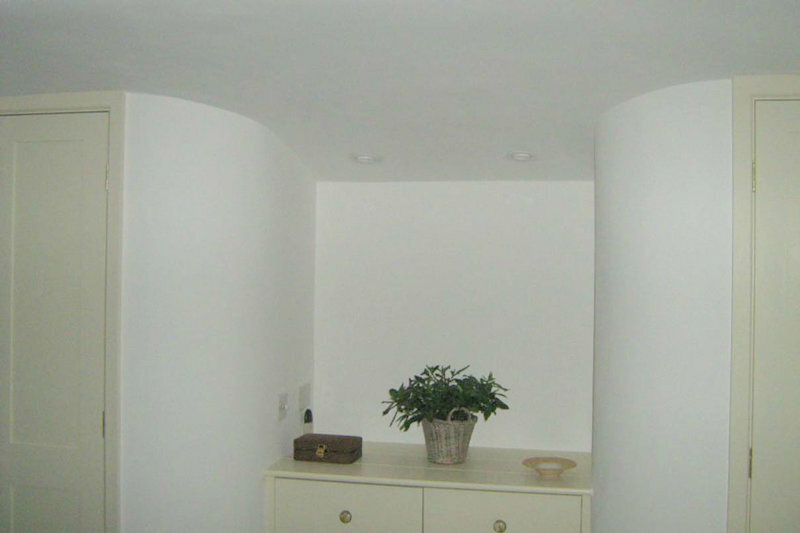 I have been a plasterer for 47 years and have a wealth of experience in the Trade. I've worked on a lot of prestigious contracts over the years, from modern buildings here in Scotland and the rest of the U.K, to a three hundred year old church in Germany and a five hundred year old castle in Switzerland. I wish I had some Japanese trowels at that time. I have to tell you that I am loving the 240mm Jigane that you sold me. 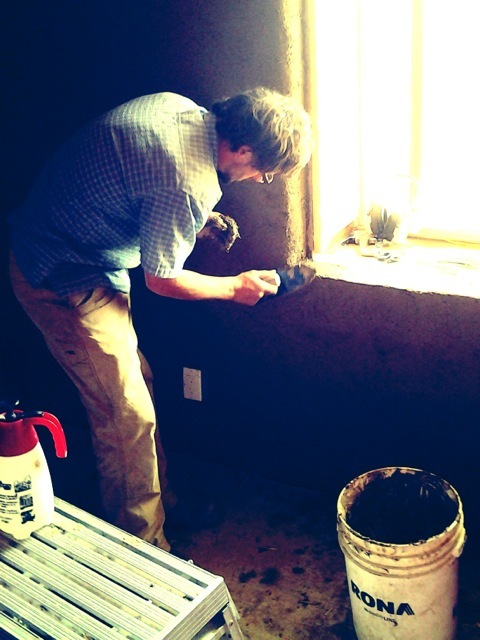 I am totally having a blast with it doing the top coat plaster on the straw bale house I am building. 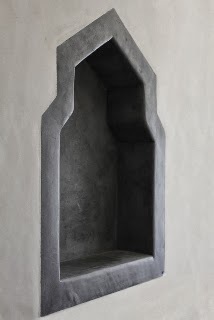 The iron really allows me to place the plaster where I want it and the stiffness of the trowel allows me to quickly shape the wall how I want it. I can not imagine a better tool for applying straw clay plaster. Thanks heaps! Great tools and fantastic service.